The arc shaped Himalayan range extends for 2,500 km along the entire northern boundary of India. These, the highest mountain ranges on our planet, are majestic and awe-inspiring. They are a tribute to the power and beauty of nature. 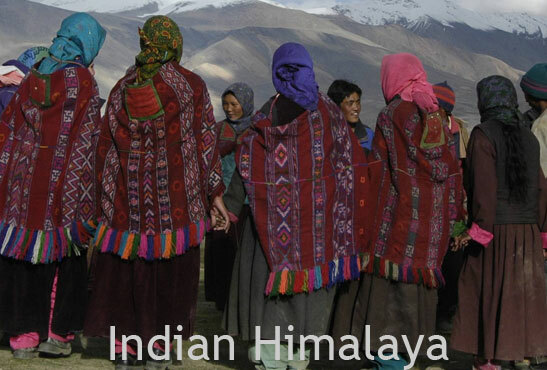 Without match, their terrain has provided natural barriers, so that today’s visitor may still obtain a glimpse into ancient ways of life - the purity and simplicity of the Himalayan people. From the highest altitudes (Khardung la Pass at 18,380ft) that are barren yet colourful “moonscapes” only passable in the summer months, to the lower foothills (Manali 7,000ft and Dharamsala 2,500ft), green and small in contrast, this area always offers a fascinatingly different view. Spectacular terrain offers breathtaking trekking. Ancient traditions bring a depth of respect to the landscape perfect for pilgrimage and quiet internal reflection. For the traveller - monasteries, stupas, mani walls, prayerflags and hermitages dot the landscape. Marmots, yaks, horses, deer and mountain flowers breathe the pure air. Try remedies from physicians of traditional medicine (known as amchis) and/or partake in a feast of skew (Ladakhi meat and noodle stew) momos (Tibetan dumplings) and chang (Tibetan style barley beer). 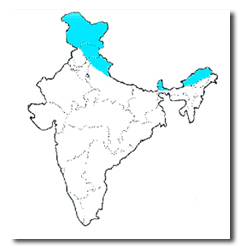 Five states to choose from – choose one or all - from west to east these are Jammu and Kashmir, Himachaal Pradesh, Uttar Pradesh, Sikkim and Arunachal Pradesh. Lying at altitudes of between 9-25,000ft Ladakh – “land of high passes”- is a cold high altitude desert that lies in a complete rain shadow cut off from monsoon clouds by the great Himalayan range. Ladakh is like no other place you have ever been. It is a stark lunar landscape with a traditional people still moving in a long forgotten moment of time. As one goes more and more remote in these high valleys you will forget your busy world and begin to move at a different pace and with a different perspective. You will lose yourself in a landscape where wind, water, ice and chemical reactions have carved a rare landscape. Leh Is the gateway to Ladakh. Its capital and service centre – an active town for all surrounding areas, it is reachable by a very long yet spectacular drive from Manali or by air from Delhi. 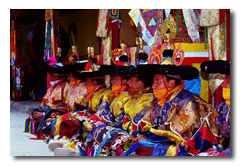 Leh is beautiful and has been at the heart of the Tibetan-Buddhist culture for centuries. Its colourful gompas, stunning landscape and it being a kick-off point for so many wonderful treks makes this place a must to visit. Places to see in Leh include Stock palace – the residence of the King with a renovated museum, Shanti stupa – take in the evening sunset over the valley while praying for peace, Shey and Thiksey monasteries – where the earliest Tibetan kings ruled from and the place of the large Maitraya statue, Stagna Gompa – built on a hill which is shaped just like a “tiger’s nose”, owes its inception to a great scholar saint of Bhutan, Hemis Gompa – one of the richest and largest gompas built in 1600’s, this is where the famous Hemis festival with colourful lama dancing is held each year. Once every 12 years a huge painting of Buddha is hung and displayed for the public, over the walls of the monastery. Literally meaning “valley of flowers” this astounding and spectacular valley sits on the trading route that connected eastern Tibet with Turkistan via the famous Karakoram Pass. Best to visit here for 2-3 nights and imagine what it is like for these friendly people living here in complete isolation for most of the year. A highlight of this valley is a ride on one of the Bactarian Camels (double hump Camel) that roam the sand dunes. Other attractions include Deskit and Samstanling monasteries. Driving to Nubra is spectacular and you will cross Khardung la Pass (18,380 feet) which is the highest motorable road in the world. A high altitude (13,900ft) brackish/salt water lake. One third of the lake lies in India while two thirds of the lake lies in Chinese Tibet. It is about 5 hours drive from Leh, but most of it is through spectacular valleys. On the way you will cross the third-highest pass in the world - Changla pass, where army sentries and a small teahouse greet visitors with free tea. One of the most beautiful places on earth, this huge crystal-clear deep blue lake (28km long and 4-6 km wide), is flanked by massive snow mountains, which fall into Tibet. Its tiny town of Korzok (15000ft) is the centre for about 1500 nomads who graze their sheep and yaks in the high altitude pastures surrounding the lake. 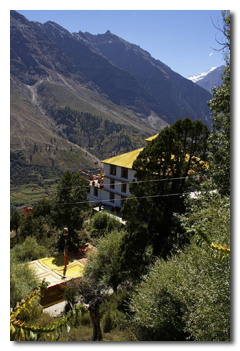 Alchi is a small village with clusters of white and brightly painted houses and many Chortens. It is noted for one of the oldest monastic complexes in all of Ladakh. Its wall paintings have a distinctly Indian influence. Lamayuru is a magnificent sight as one winds one’s way through this majestic landscape. Situated high on the mountain-top it is one of the oldest monasteries in central Ladakh. It houses some 150 monks. Mulbeck is a small village on the Leh-Kargil-Srinagar highway, 53km from Lamayuru and 32km from Kargil. This beautiful village is famous for an 8m high Chamba Buddha, which they say spontaneously arose on the vertical rockface. It dates back to the 1st century. Mulbeck marks a kind of border between Buddhist Ladakh to the east and the Muslim areas around Kargil to the west. 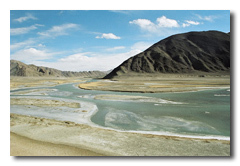 Zanskar is a stunning valley encircled and enclosed by a ring of high mountains. It is accessible only by long and arduous roads through high passes. Though some 30 hours drive from Leh or Srinigar, it is well worth the journey for a real peek into what is now one of the few remaining untouched civilisations. Separated from Ladakh by the Zanskar Range, Zanskar’s roads linking the inhabitants to the outside world opened only in 1981. A landscape dotted by small villages, cliff-side monasteries and cultivated fields, most of Zanskar’s landscape is barren stillness surrounded by folded hills and extremely high, mountain peaks. 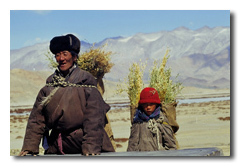 Once a part of Western Tibet, Zanskar’s population consists mainly of Buddhists with a small Sunni Muslim population. The agrarian lifestyle and isolated geography of the area have fascinated and attracted a wide range of scholars, mountaineers, practitioners, and tourists. Regardless of one’s background and motivation, visiting Zanskar is an experience one will never forget. The valley of Kashmir sits at an altitude of about 5,000ft. Srinigar is at a lower altitude (1500ft) and its picturesque lakes ensure it is an attraction to visitors all year round. The winter capital of Kashmir is the city of Jammu. It marks the transition between the Himalayas and the plains of India’s Punjab and has many historical temples. Heading up the Rohtang pass (13,000ft) from Manali, one can either go down and right into Spiti valley or left to Lahoul. Both are beautiful Himalayan landscapes, with deep gorges and in the summer lush valleys where some of India’s best peas and pototoes are grown. Spiti is lower than Lahoul and both sport a rich Buddhist cultural life with great trekking and adventure and nature tourism. Home of the Tibetan government in exile, this small hilltop community has attracted foreigners for many years. They come to see a rare and beautiful people who have a culture and spiritual practice that has touched the modern lives of so many in the west. One can do courses here of all types, visit old and learned masters, hang out in the many coffee shops or restaurants, circumambualte the home of His Holiness Dalai Lama of Tibet, along with his devoted people both young and old. See smiling faces, curio shops, and mountain vistas. Meet people supporting the Tibetan cause – this is a rarified envionment – different than the rest of India which sits in the valleys and plains below. 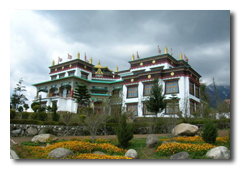 This is a small Tibetan colony dotted with many monasteries set in the rural area about 3 hours from Dharamsala. 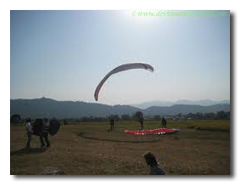 It is also home to an international paragliding community. This rural town sits beside the famous holy lake where Guru Rinpoche survived being burnt to death. Now a large 123 foot statue of Guru Rinpoche overlooks the lake. The hills above host many old practitioners still living as hermits. Rewalsar is holy to Buddhists, Hindus and Sikhs. The last stop before heading up to the Rohthang pass and the high Himalayas. The Rohtang pass is closed from about May-October each year due to snow and ice. A beautiful place set among the fir trees – especially if you walk in the hills. You can begin or end a day’s hike by bathing in the hot springs at Kailat or Vashist. At the ancient and unique Hadimba temple which is set in a cedar foest, you can have a yak ride and wear local dress! There are many beautiful hikes to waterfalls in Manali – you will just need someone to show you the way. Also visit the Solang valley with its paragliding and a 300ft chairlift. Manali is a great base for many adventure sports - white water rafting, paragliding, helicopter skiing and so on. Many treks, challenging and easy begin from Manali – there is a very nice one hiking from Manali to Dharamsala. A picturesque town with an old castle. Visit the old home and art gallery of the Russian naturalist/artist/philosopher, Roerich. Naggar is a great day visit or one night stopover between Kullu and Manali. Darjeeling is famous throughout the world for the tea it grows. 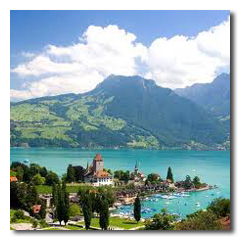 It is a well-known hill station with a strong colonial past and its toy train has UN heritage status. This small steam train winds slowly up and down the hill many times a day and is a special treat for visitors. The bustling market is full of spices, curios and clothes and a perfect place to taste the local life. Visit a tea plantation, see the monasteries and take in the views at Tiger Hill where you can see sunrise over Mt Everest. For a days outing you can boat of the placid Mirik lake while drinking in the view of Mt Kanchenjunga. 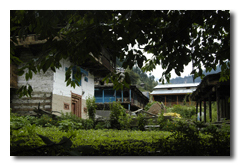 Mirik area is surrounded by tea and cardamon plantations, as well as orange orchards. 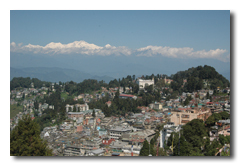 Kalimpong is on the old trade route between Tibet and India and still holds the feel of a trade town. Here you can go on a shopping spree for traditional handicrafts such as woodcarvings, copperware like feng-sui bells, tapestry bags, scrolls, paintings and Tibetan jewelry. Sikkim is an old kingdom, now a state of India, which borders with Nepal, Tibet and Bhutan at its highest points, and then drops down like a precious stairway to Bengal in its south and east. Some say it is shaped like a gem and to all it boasts some of the most stunning scenary how earth has to offer. This landlocked nation boasts beautiful treks with stunning Himalayan snowcapped mountain views, high mountain lakes and golden monasteries. Sikkim also has a rich cultural diversity – Nepali, Bhutias, who migrated from the Kham district of Tibet in the 14th century, and the Lepchas who are believed to have migrated from the Far East. Northeast India's remotest state is also known as `Land of the Dawn-lit-Mountains'. Bounded on the three sides by Bhutan (west), Tibet (north/northeast) and Myanmar (east) with India’s Assam and Nagaland sitting to its south. This region is the first Indian soil to greet the morning sun. A remote and hidden land, this thinly populated mountainous tract is criss-crossed by turbulent rivers. It has heavy rainfall, deep, dense forests, over 500 species of orchids and large game. The people are tribal and have seen little tourism, which makes this a fascinating region to explore. Best time is April to October. Summer is the best season to visit most of these areas as they are closed in the harsh winter months when roads are covered with snow and rivers become ice – the Rohtang pass above Manali usually opens sometime in May and will close again around October. Of course if you are an adventurist/pilgrim or lover of snow you may like to fly into Leh, Ladakh in winter - it is definitely picturesque and you can hear the silence! The lower Himalayas - Himachaal Pradesh, Jammu and much of the North East are accessible all year round. Send us an email outlining the names, and countries of all travelling plus dates of travel and your interests. We will regularly be in connection with you to finalise your personalised itinerary.